I was standing there holding my Fuji when the guy burst into the room, looked at me and exclaimed: "My God, you've got a big one!" I replied: "Thank you for noticing. Now, what do you think of my camera?" 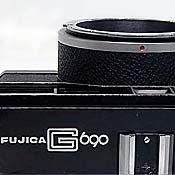 The first modern 6x9 rangefinder camera, the Fujica G690, was announced in March 1968 at the Tokyo 9th Camera Show and launched in Japan in December on the same year. It looked like an ordinary 35mm rangefinder camera, only much bigger, and much heavier too with its metal body and solid brass covers. 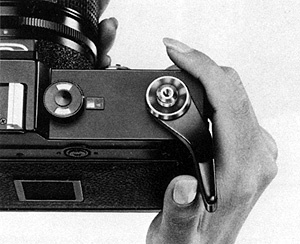 The viewfinder featured a coupled double-image rangefinder with reflected frames and automatic parallax correction. The body had a nice black enamel paint, with chrome finish interchangeable lenses, thanks to a proprietary breech-lock mount bayonet. Chrome lenses have a similar look and feel as the classic Zeiss lenses for Hasselblad cameras. The G690 took 8 6x9 pictures on a 120 film, or 16 pictures on a 220 film. 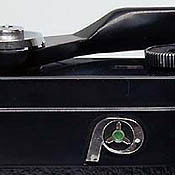 Film format selector (120/220) and frame counter located on top cover, next to the flash shoe. The film memo is a great feature if you have two camera bodies: you can use one loaded with B&W film and the other with color, overcoming the main drawback of this camera which has a fixed back and no removable inserts. It was also possible to use 6x9 sheet film, thanks to a Roll/Sheet selector on the back of the camera. 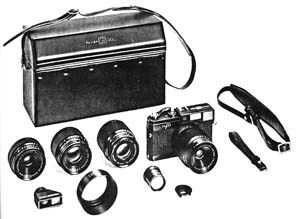 The camera body was built like a tank and had very few moving parts susceptible to failure (no swinging mirror, no focal plane shutter, no exposure meter). Its foolproof design made it rugged enough to withstand years of professional (ab)use. 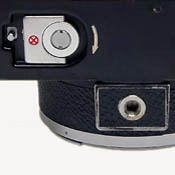 The Sheet/Roll selector on the right of the viewfinder, beneath the film advance lever. Since the lenses had their own Seiko 0 leaf shutters, a lightshield curtain was required to protect the film from light while changing lenses. The lightshield curtain was interlocked with the shutter and the film advance mechanism, preventing blank or double exposure (if only they could have made the lens cover with an interlock feature too...). Four lenses were available at the time: f:8.0 65mm wide-angle, f:5.6 100mm normal lens, f:5.6 150mm short telephoto and f:5.6 180mm telephoto. There were built-in frames in the viewfinder for the 100mm and 150mm lenses, while the two other lenses needed accessory viewfinders for framing. 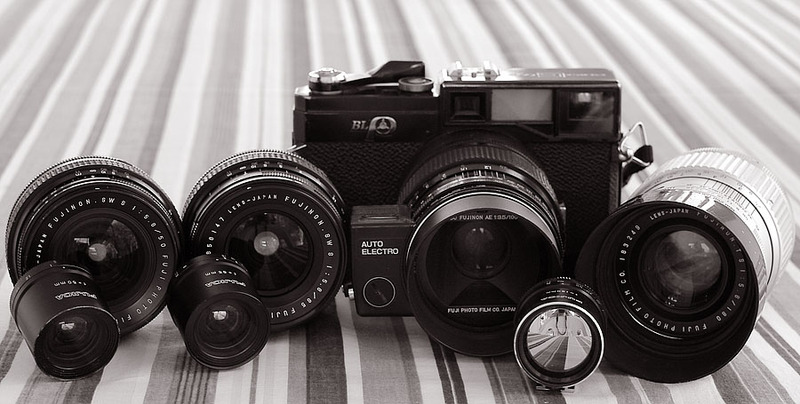 From left to right: Fujinon SW S f:5.6/50mm with finder, Fujinon SW S f:5.6/65mm with finder, Fujinon AE f:3.5/100mm mounted on Fujica G690BL, Fujinon T S f:5,6/180mm with finder. Then came the G690 BL in October 1969. Not a major upgrade from the G690, except for the "BL" logo on the front plate, a slightly different lightshield curtain handle design and a safety feature to prevent removing the lens as long as the lightshield curtain has not been closed. 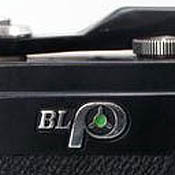 The rangefinder front frame was painted with black lacquer, instead of the previous "chrome" finish. The lenses for the G690 BL were now made in a black finish assorted to the camera body color, giving a more pleasant look. 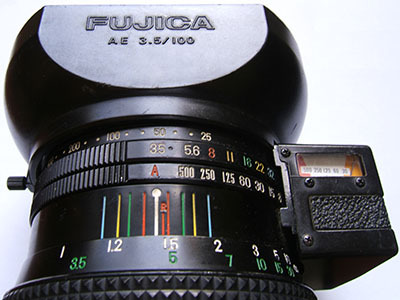 The GL690, which appeared in November 1973, was the first and only 6x9 camera offering auto-exposure and auto fill-in flash, thanks to the Fujinon AE f:3.5 100mm lens. The new camera was lighter than its predecessors (1148g vs. 1260g) and Fuji claimed that it was also more reliable, although this point has to be proven. 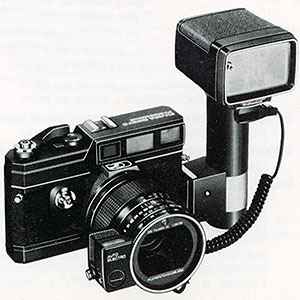 It offered a redesigned viewfinder with automatic field correction: when one focuses closer, two right-angled framelines moved closer to each other to reflect the actual FOV. On the GL690, the viewfinder showed 95% of the image at 1m and 92% at infinity, which is outstanding for a rangefinder camera. 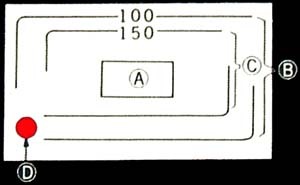 The lightshield curtain indicator in the viewfinder was dropped. Great tool for photojournalists and wedding photographers, the 100mm AE lens allows full automatic fill-in flash (photo Fuji). 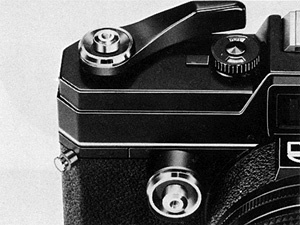 The GM670, its 6x7 twin which was released in January 1974, was essentially the same camera as the GL690 (same weight, same size, same lenses), except for picture size, viewfinder frames and film-winding mechanism (10 exposures per roll instead of 8 with the larger format). 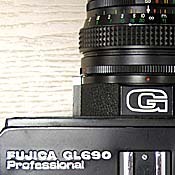 The GL690/GM670 had a second shutter release button on the front plate, designed for easier use in vertical picture taking, and an upgraded rangefinder with brighter frames. 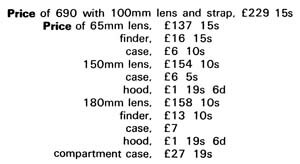 The neck strap eyelets of the older models were replaced by the same retaining lugs as on Mamiya pro and Pentax 67 cameras. 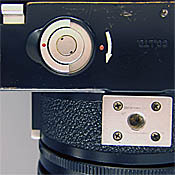 The viewfinder eyepiece was made circular and threaded, allowing to attach a diopter correction lens or an angled finder (like the Nikon DR-3). For head shots in the studio, the G690 can be mounted on a tripod and equipped with the close-up lens accessory and an angled viewfinder. Thanks to the leaf shutter, studio strobes synch at all speeds. Apart from the AE f:3.5 100mm, two other new lenses were introduced at the same time: a f:5.6 50mm ultrawide and a f:5.6 version of the 65mm wide-angle. The new lenses available with the GL690/GM670 had focusing rings with textured rubber inserts. This newer generation of lenses was of lighter construction than the old G690 lenses. 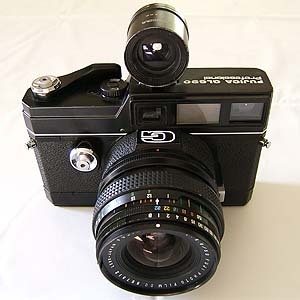 The GL690/GM670 were the last interchangeable lens rangefinder medium format cameras ever made by Fuji. After ten years, production eventually ceased in November 1978, allegedly because of potential reliability problems. As a matter of fact, it is more likely that Fuij Optical was quite disappointed with lens sales figures. As the saying goes: "give a dog a bad name and hang him". 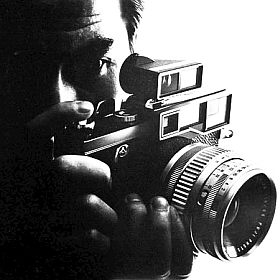 His successor, the GW690 -- a simplified, lighter, fixed lens camera -- was launched, soon to be joined by the wide angle GSW690 in 1980. 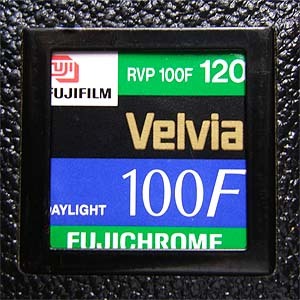 Unfortunately, Fuji decided to provide a counter to record the number of film rolls used. 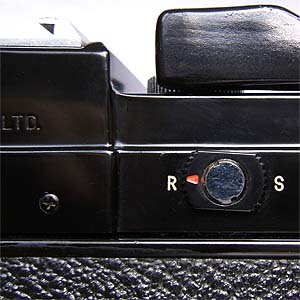 This feature made the shutter release of the new cameras much more noisy than their predecessors'. 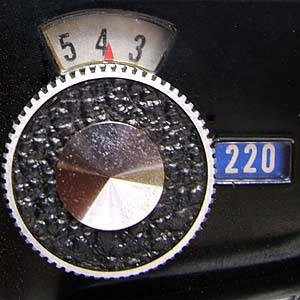 In fact, the counter was of limited use, because it could be reset by opening the base plate of the camera and pressing the small black button next to it -- if you plan to buy a used GW camera, don't trust the number on the odometer... The long exposure "B" shutter setting was abandoned for an awkward "T" setting with no provision to end the exposure without winding the film or selecting another speed setting. The lovely 100mm Tessar-type lens was replaced with a 90mm offering slightly better resolution wide-open, but less suitable for portrait, due to its shorter focal length and harsh bokeh. As time passed, more and more plastic was used in the construction of the subsequent mark II and mark III models. 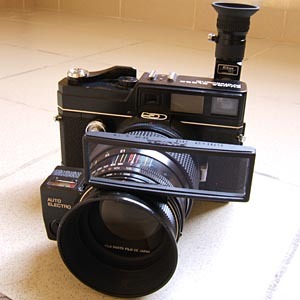 Another heir of the G690 is the famous G617/GX617 panoramic camera, introduced in March 1983, which was build on the same mechanics, of course with a larger plastic body in order to accommodate the huge 6x17 picture size. The first G690 has been in production for less than one year. The subsequent G690BL, GL690 and GM670 models are easier to find and their price is very reasonable considering the high quality and durability of these classic cameras. I find the GM670 less attractive, but I am partial to the 6x9 format: I do lots of landscapes and I like the aspect ratio of 6x9 (the same as 24x36), much more than 6x7, which I find too square. I like particularly to shoot with a 50mm ultra wide on my G690 and get a picture of more than 90 degrees coverage, which I can turn easily into a great panoramic shot by cropping the top and bottom part -- or only the bottom to get a built-in lens shift feature for architecture shoots. 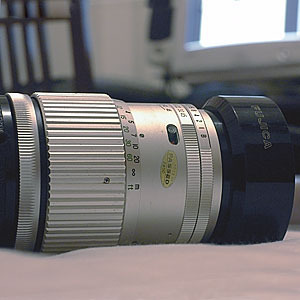 On a GM670, one would need a 43mm lens to achieve the same field of view, and the resulting cropped panoramic image would be smaller. And I just don't see the point of sacrificing some precious negative real estate only to get two more frames per roll. If I need to take more pictures before reloading, I can switch to 220 film and get 16 shots per roll instead of 8! If you plan to buy a G690/GL690/GM670, check the lightshield curtain mechanism, because the spring has a tendency to become loose after many years of heavy usage, causing the curtain not to open fully when released. This problem is easy to fix and does not impair the ability of the camera to take pictures (but you won't be able to change the lens mid-roll). Those cameras are very well built and there is not much that could fail. The only serious problem you could encounter is a damaged film winding mechanism. 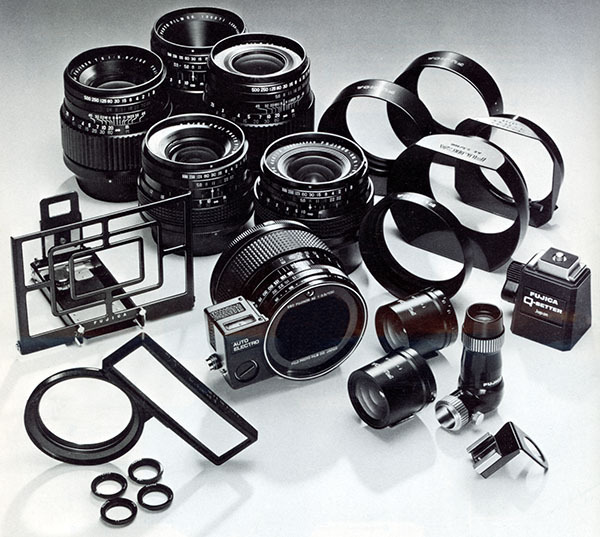 As there are no spare parts available from Fuji, you may have to sacrifice a second camera as a donor for the repair, although a skilled machine operator should be able to create the missing parts from scratch. All lenses for G690 cameras offer superb resolution and high build quality. Nowadays, these lenses are rather difficult to come by, the most desirable being the one of its kind 50mm super wide and the incredibly useful AE f:3.5 100mm automatic lens. The Seiko leaf shutters are easy to maintain and repair. And one of the main benefits of the leaf-shutter type interchangeable lens rangefinder cameras is that there is one shutter in every lens, so in case of shutter failure, a lens change will allow you to resume shooting immediately. ©Sébastien Lallement 2005-2008 - All rights reserved.